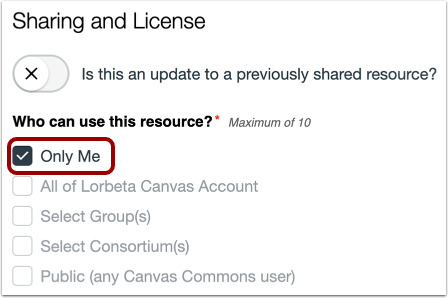 When sharing a resource to Commons, you will need to choose who you want to share your resource with. 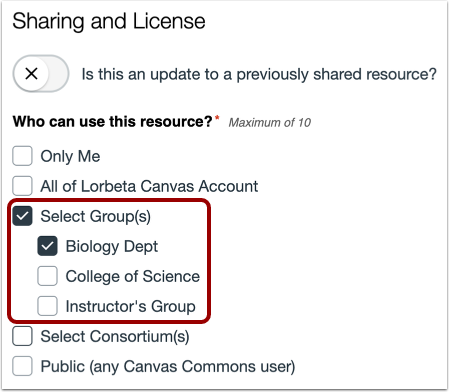 There are five sharing options available: share to your entire account, share within groups, share within consortiums, share with the public (all Canvas Commons users), or you can set a resource only visible to yourself (private). Select one or more options (maximum of 10) for sharing your resource(s). Standard Canvas file storage limits apply, however, anything shared publicly will not count against your quota. When updating resources, resources that are no longer in a user's scope will not appear on the user's Updates page. For example, changing the share option from your account to within specific groups. To share the resource with your entire account, select the All of [account] checkbox. If you share to your entire account, the resource will be shared to all groups within the account (including groups you may not belong to). To share the resource within groups, select the Select Group(s) checkbox. This includes the ability to share with all or select groups. Note: Group visibility is based on your group membership(s). 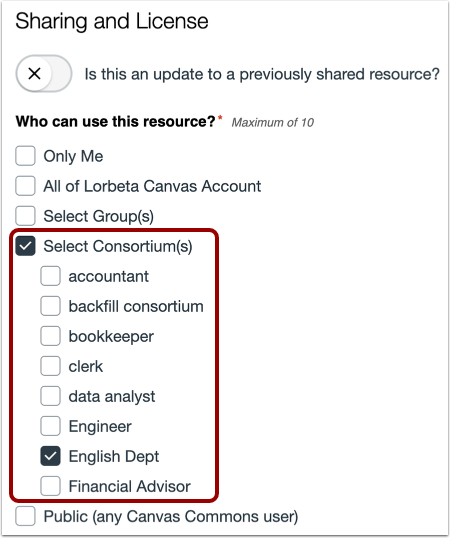 To share the resource only within consortiums, select the Select Consortium(s) checkbox. This includes the ability to share with all or select consortiums. 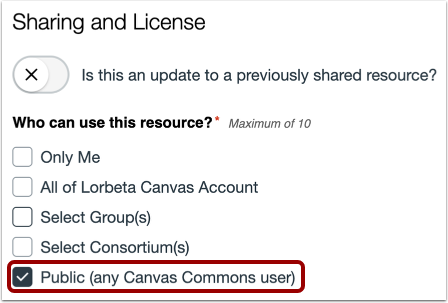 To share the resource with all Canvas users, select the Public checkbox. 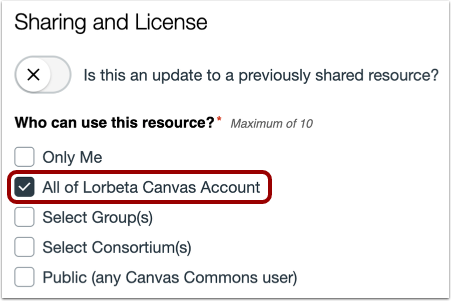 The shared resource will be publicly available to anyone using Canvas. To share the resource with just yourself, select the Only Me checkbox. Previous Topic:What types of content licenses are available in Commons? Next Topic:What types of document and media files can be shared to Commons? Table of Contents > All Users > What types of sharing options are available in Commons? Re: I imported my class to the commons, but now it can not be viewed from the commons. Re: How can I make a file available to all instructors?